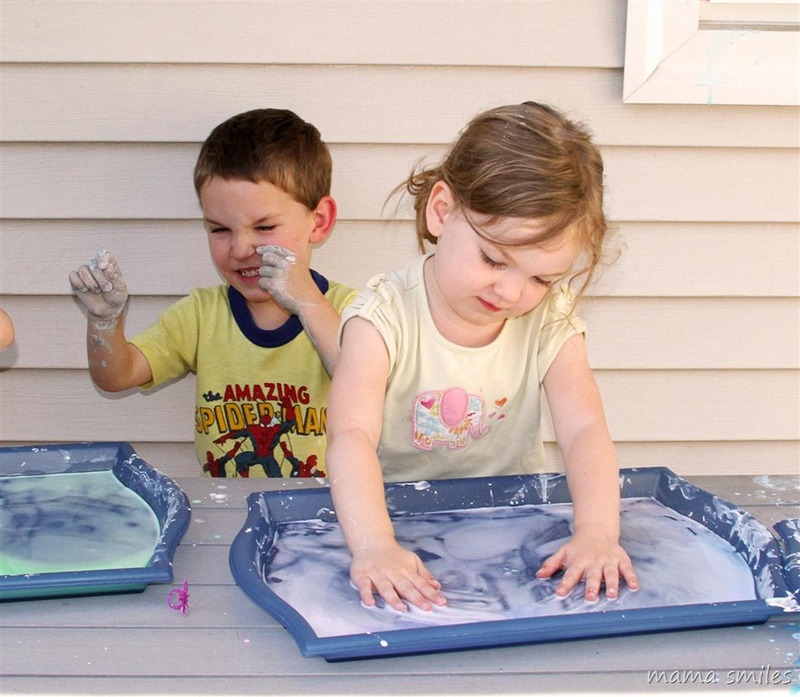 Kids love sensory play, but it can get sooo messy!!! 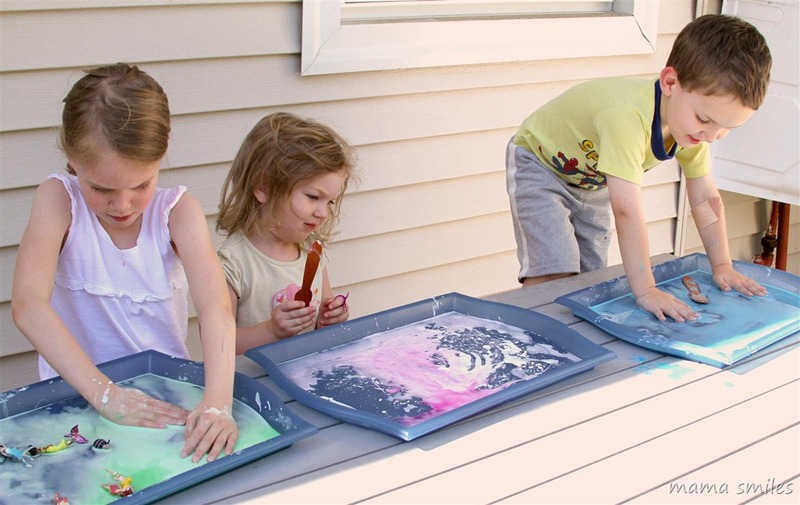 This outdoor summer sensory play idea is always a hit with my kids, and a breeze to clean up. One of the things I love about summer is the ability to take messy sensory play outside! 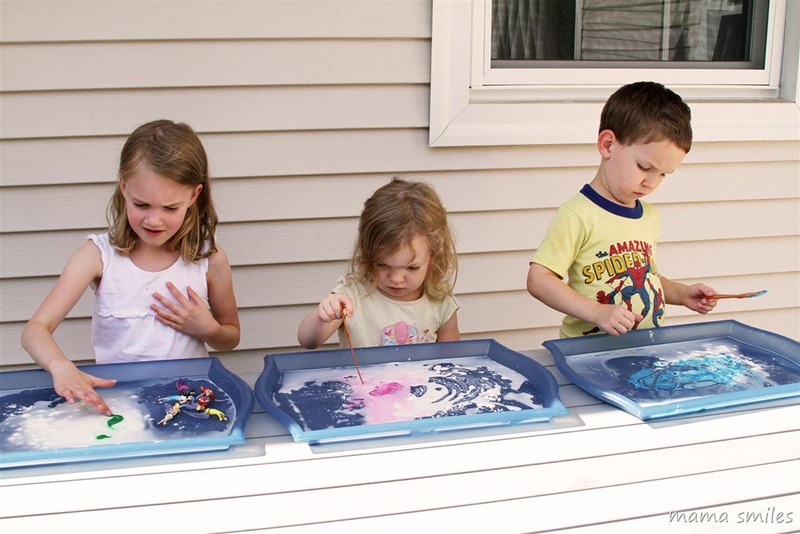 I set the kids up with individual trays of corn starch, water, and washable paint. They started off pretty cautious, but gradually became more involved. Everything hosed off easily at the end, and we’ll definitely do this again this summer – probably with more corn starch and water in each tray! 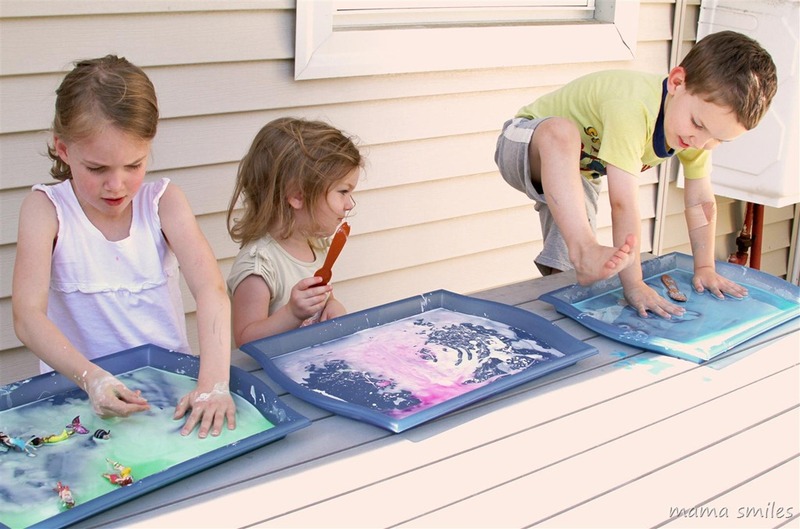 What is your favorite messy activity to take outside in the summertime? Mud, mud is all the rage right now here. We have a water ban on, or I’m sure my kids would be all about mud! I’m surprised we don’t have one, but they are finding the smallest patch of mud in our yard and covering themselves in it. That picture with Johnny’s foot hovering above the tray is CLASSIC! Love it! I will definitely keep this messy, but easily hosed off, combination in mind for warmer weather! Very cool. Thanks for the great idea! i love the different looks of concentration on their faces in the first pic. we’ve so got to try this… just not outside. with days averaging at 105+, it’s toooo hot! That is way too hot! Hope it cools down for you soon! Love Johnny’s “all in” photo! Aww they are so cute! Lily looks likes she wasn’t lovin’ it! :) And I love the photo with him sticking his foot in the tray! Such a cute activity. My daughter would be like Lilly, not really sure about getting stuff all over her hands. I love how your son was diving right in. So funny. like this idea thanks for sharing. lol sounds like J and your dog are having a fantastic time! Fun! My kids love oobleck. They also love to just fill up containers with water, leaves, and whatever else they find and pretend to have a party. Best thing about summer is when we can let our kids play outside and just get messy. Slipping and sliding in paint and detergent. I love the photos – they really show how different kids are. Looks like a fun activity. Just stopping by to let you know I featured this on the Sunday Showcase this week! http://www.theiowafarmerswife.com/2012/07/the-sunday-showcase-sensory-play.html Pop over and grab a button if you’d like! I love your son trying to climb in it – that would have been my daughter’s preference too! lol!